School holidays are wonderful. The kids love them. Who wouldn’t? Before the Easter holidays, however, I did my usual secret panic attack: how was I going to keep my dynamic girls occupied for two whole weeks? 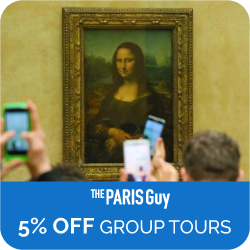 Sure, we live half an hour away from Paris with SO much to do. But sometimes, we just don’t feel like going to the big city. On a gorgeous day we’d rather not be in traffic jams, or metros, or trains; we’d much rather be with nature. The garden was depressing, though. It was shouting at me to look after it after such a long winter. The easiest option was to run away. This tree looked like it was looking at us! Did you know that The Three Bears was a Scottish fairytale? There were no berries in sight yet, though. We were here to forage stinging nettles for our supper. The forest of Saint Germain-en-Laye has a regal feel to it. The forest is also part of the grounds of the Château of St Germain-en-Laye. 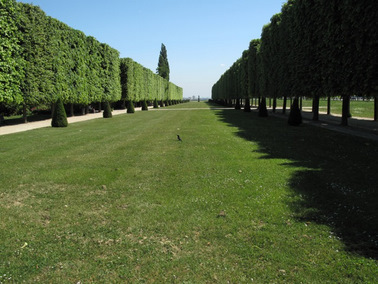 It’s spooky to think that Louis XIV could have been hiding behind that tree, targeting some game for a royal dinner. 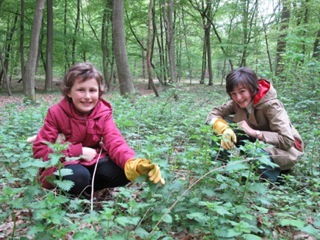 Last year, we picked bags and bags during the Easter holidays: but this time, the nettles were far too small. They were still stinging, though. Just after I snapped this photo, Lucie jumped up screaming, “I’m stung, I”m stung! Whah!”, and so Mum had to find some dock leaves quickly to calm her before getting home. So, the project this year fell completely flat. But it didn’t stop the children having a good run around and to play spook. Pick the higher leaves and don’t forget the gloves! A few days’ ago, however, the children were at school and I was just sick of the computer. The sun was out in all its glory and so I returned as goldilocks to the forest. 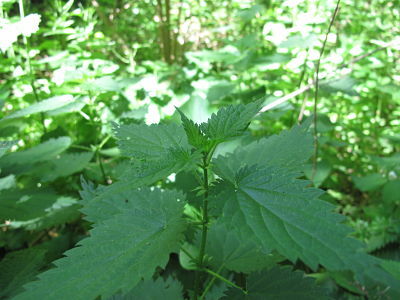 This time the nettles were perfect: beautifully tall and with plenty newer leaves to pick at the top. Why do you pick them at the top? They are less bitter than the tougher leaves and most importantly, you don’t want nettles that could have been sprayed by foxes or dogs on their walks, for example. 😉 Also ensure you never pick nettles next to the roadside, as they risk being sprayed by herbicides. You want them as pure as possible, as nature intended. As I was picking them, a shocked passer-by asked, “Vous cherchez.. les orties?” When I explained I was picking them for supper, he took to his heels. Did he think I was making up some magic potion, or something? Anyway, walking out of the forest, you arrive in the castle grounds. At the end of this avenue, you have a look-out to La Defense with the Eiffel Tower in the background. The weather is so glorious, that everyone is hiding on benches in the shade. Back home, still armed with the gloves, it was time to give them a good wash and soak. I had heard that nettles are good for you, but on reading up on their health benefits, they contain a high amount of iron and many other vital vitamins and minerals, including magnesium. 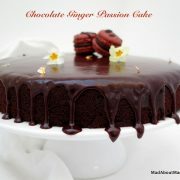 OK, my excuse for eating dark chocolate for magnesium can perhaps be substituted this week for nettles. 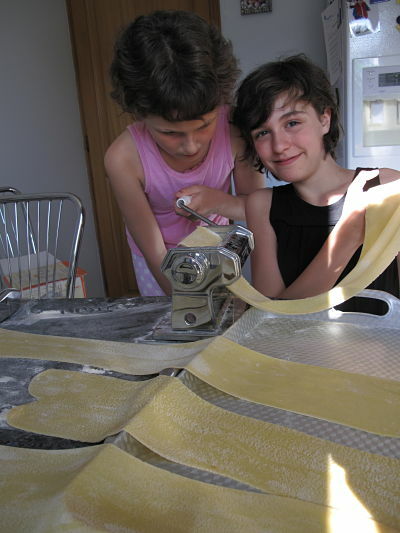 Back to keeping the children occupied: while I blanched the clean nettles in boiling water for a couple of minutes (to take away the sting), the children were having fun making some fresh pasta. They love making pasta so much, there is always a fight who gets to turn the handle. I was wanting to make some nettle ravioli with Corsican brocciu cheese. That’s for the next time. The quickest solution was to whiz together the blanched nettles with garlic, parmesan, olive oil and toasted pine nuts for some stinging nettle pesto (see recipe for nettle pesto). This has to be my favourite dish in the world in the Springtime. It’s also THE dish I love to serve when we can finally sit outside for dinner. 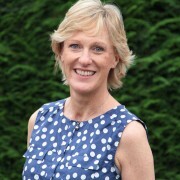 Sun shining, glass of wine in hand, plate of fresh tagliatelle and pesto? Forget everything else in the world! I’ve never seen or heard of nettles, but I’m sure they made for a delicious pesto. 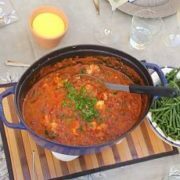 I totally agree with you about the bliss of sitting outside with a dish like this and a glass of wine. Thank heavens that the sunshine and warm weather are upon us! 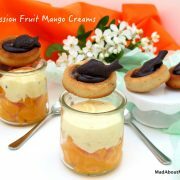 Your photos are always so beautiful and this recipe looks delicious! haha magic potion..i’m sure you sneaked some aside for tht without confessing it here!!! your daughters are so resourceful…they can make pasta instead of being glued to the screen…wow lovely upbringing Mommy Jill! I am so loving reading about all of your adventures! My life is so boring compared to you Jill!! the flowers can be eaten? wow that’s something new for me. I usually use the leaves for cooking, and yes it goes well with pasta. Just loving it. What fun it was to read about your adventures in the forest. It’s so amazing to think of the history of that area. It looked like a fairytale. What a fun day! I live near woods too and it’s always a great day to spend the day. I remember when I was a child my grand-grandmother used to take me to pick nettles. Oh, I lost count how many times I forgot my gloves and got bitten. Love your pesto idea. Thanks for sharing. Your daughter are so beautiful. I’ve always wondered about Stinging Nettles. who knew you could make pesto out of them? Fresh pasta is always so delicious no matter how simple the recipes. The kids looked as though they are having a ball! I wish I could get up and run off to the forest when I want to! Sounds like so much fun!! You and your lovely sous-chefs have done a fabulous job with that pesto and pasta… yummy! Oh yes…what lovely girls you have! I have two boys and our trips to the woods are a little bit different. But still fun. Great! 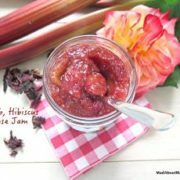 Would you be able to tell me who gave tons of recipes on nettles online and I can link up? That would be cool. Your posting really stairhtgened me out. Thanks! I understand about being sick of the computer. You did the right thing – you ran away for a while. Loved seeing the pictures of your girls. They are so talented in cooking already! Can I hire them to make that gorgeous pasta for me? Although that would probably be very expensive pasta because I’d have to fly them to America..lol. What a fun day!! And oh, how I could go for a two week holiday from school. We are counting the days until it is done and then it will be 5 weeks till Bahamas!!! Woo Hoo!!!! I’ve never heard of stinging nettles, and certainly wouldn’t have thought to make pesto out of them. I read the health benefits and I’m intrigued. Don’t really think I’d vote for it in the macaron either…!! Your girls are adorable, so glad you are enjoying your break! Where exactly are you if you’re 30 minutes from Paris? I was born in Chantilly. I’ve never seen nettles before so beyond being a post with gorgeous food (and girls), you taught me something. Thank you very much! 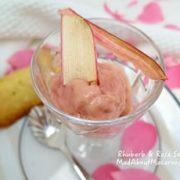 Wow, this looks so delicious and spring-y, I love it! I have to say, I was expecting a stinging macaron – that would be fun. Our nettles are pretty much over now – too big and tough. But we had nettle pasta and nettle risotto and nettle stir fry and nettle tart and lots of nettle soup. We love nettles. Had no idea you lived near the forest. I’d thought of you in the middle of bustling Paris, but I’m glad to know you are close to trees. It all looks magnificent. A forest that turns into an immaculate park with amazing views – lovely. What a great day!!! Look at that pasta – they are masters! Love the beautiful photos, and especially the homemade pasta. Your children certainly had fun helping you. 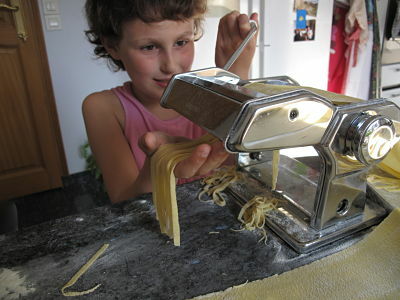 I also have the same crank out type pasta machine, from years ago…this is the one that works best. The electric kind that I paid a lot of money for that has all the different shapes, is donated to Goodwill! What a lovely pasta dish..I just love it! And photos are just so beautiful as well as your stunning girls! Thanks for sharing!!! I have never tried stinging nettle but I am sure it must be delicious with homemade pasta and pine nuts. How fun! 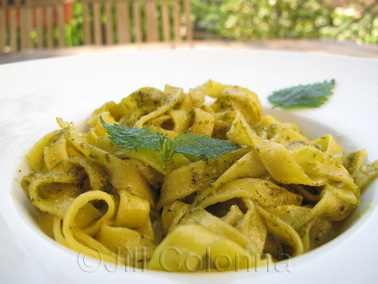 The pasta with nettle pesto sounds wonderful! I’ve recently worked with nettles too, and made a really yummy nettle puree. Hahaha hubble bubble! So funny that the passer-by fled! I didn’t know The Three Bears was a Scottish fairytale but I should have guessed as they were having porridge for breakfast. Your daughters are beautiful and foraging is such a lovely skill to teach them. I had been planning soup for my crop of nettles but your pasta looks so much more delicious. LOL, nettle macarons? Now that would create a buzz! 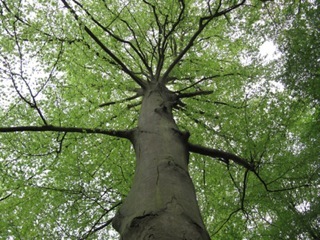 I remember walking in the woods with my dad and sisters…and the misery of those nettle stings. Never thought of cooking with them, though…what a lovely pasta dish you created. I think it’s so lovely that you could go and pick your own food for dinner. 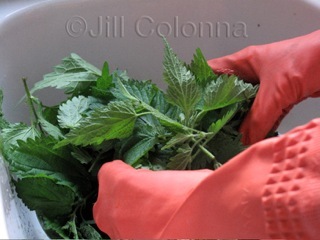 I haven’t ever tasted a stinging nettle to my knowledge, but I’d love to try yours! I always had nettles as enemies. From today I will change my strategy and I will capture them for my kitchen. Lovely to live near a forest wirh plenty of them! Nettles have always intimidated me, but the way that you present them they sound delicious! Your pasta is lovely, and I’ll bet it tasted even better :)! Beautiful post Jill! It was almost like being there with you! I love “ortiche” as well! Delicious recipe. And your girls look soooo pretty!! !<3 Have a great evening! What a lovely day with your girls! They are just precious!! I am not familiar with “stinging nettles.” Interesting to learn a new thing today. The nettle pesto looks delicious! And congrats on Top 9! 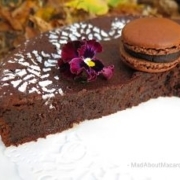 Your beautiful macarons totally deserve to be there! Oh I enjoyed reading today’s post on how you spent the day with your cute daughters and watching your lovely assistants in the kitchen! I guess all siblings fight for who takes turns.. LOL. I have never seen how to make pasta and it looks interesting and fun. Your homemade pasta meal looks amazing too! I’m very envious of your lovely forest! Especially when you can go out and pick something and turn it into this lovely pasta! 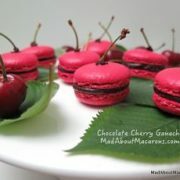 (or maybe even a macaron!) Thanks for sharing! 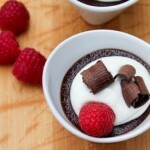 Guest Recipe: Chocolate Pots de Crème Stinging Nettle Pesto – A Healthy Spring Detox!